If you are thinking, “umm, what is she talking about…a God encounter?” I want you all to know that God still speaks to us today just like he did to the people you read about in The Bible. It didn’t all of a sudden stop it was published. We can have as much of Him and hear as clearly as we set our channels on His channel. “It is the glory of God to conceal a matter, but the honor of kings is to search out a matter.” Proverbs 25:2. He shows up differently for each of us. In ways that we were created to understand, to operate in and to find wonder in uncovering the mystery. For me, He gives me scripture, the warmth or electricity of His presence, and mostly through visions. Sometimes, I will meet Him in our special place, which is in His palace garden on a mountain top overlooking an expansive sea. Yesterday, I was lying down and I asked Him to speak to me. I abandoned all my worries from the day and said, “I want to see whatever you have for me.” Suddenly, I began to see magnificent clouds roll across a sunset-lit sky. Each glorious cloud carried a different word. The first one said, “freedom,” the next one said “love,” the third one said, “radiant” and the last one said, “wisdom.” After I saw each word, the cloud turned in to shimmer that dusted down over me. I knew God was telling me who I am in Him. He was comforting me with the fact that I don’t have to strive to be these things because I already AM these things because He created me and lives in me. and the last one said, “abundance.” He was showing me that he was fully equipping me with everything I needed. I felt an overwhelming peace remembering that I have nothing to worry about with Him as my Provider. Lastly, He sent a a luminous ribbon of light that wrapped around my entire body sealing up all the promises He had given me. Then, God’s presence came down and breathed on me speaking the word, “destiny.” Wow. I was rocked. I realized that He was sending me out into the world to do exactly what He destined me to do. The thing that motivated him to form me in my mother’s womb. I had this personal breakthrough and God moment that seemed to part the skies because of the empowerment and clarity I felt. But the fact is, none of it is new news. It’s all in scripture. 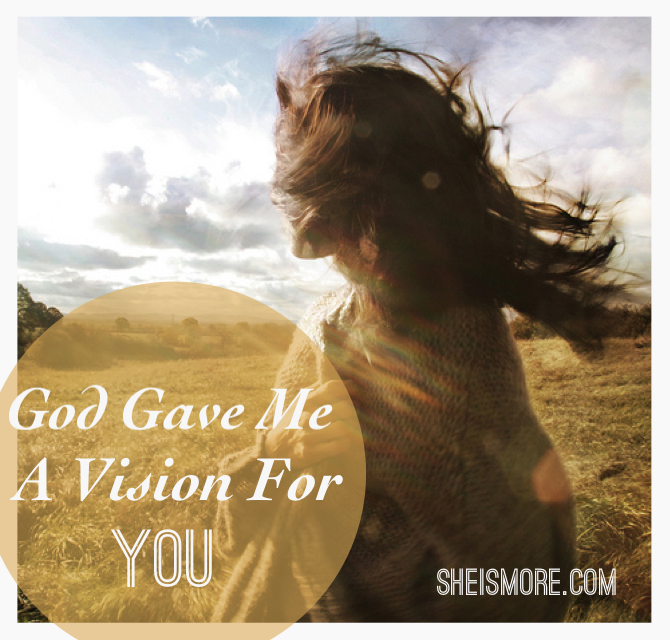 I realized that this vision wasn’t just for me, it was for you too. He knew both you and I before he created us. He knew us when the idea of us was still formless in the heavens. He physically manifested the idea of us and our destiny into the world when we were born and he has fully equipped us to carry it out. When we are born again by the Spirit, our spiritual eyes are opened and we can see and hear heavenly things that we weren’t able to before. Because Christ lives in you, you are free, radiant, wise and love. You don’t have to strive to be these things, you already are. And because you are a Daughter of the King of the Universe, you can live fearlessly relying on the provision of His unlimited glorious riches. If this message blessed you, be a blessing my sharing with others. GIRL this is so awesome that you shared this. I have these dreams and goals that I feel God has placed in my heart and I’ve questioned my abilities. I am a sometimes very shy and introverted person and I have dreams of being a world changer and working in business to influence culture. I know God can do a work in me and through me. I know there are others who have this struggle as well. And I want to share that God can do the impossible and I believe he will equip me and others with the right abilities. Thank you for this, the Lord definitely just spoke through you to give me His confirmation. God Bless girl! Our God is awesome. He says in Jer 33:3 “Call unto me, and I will answer thee, and show thee great and mighty things, which thou knowest not”. Truly He is the same yesterday, today and forever (ROM. 13:8). Indeed He still speaks today and alwaysalways!